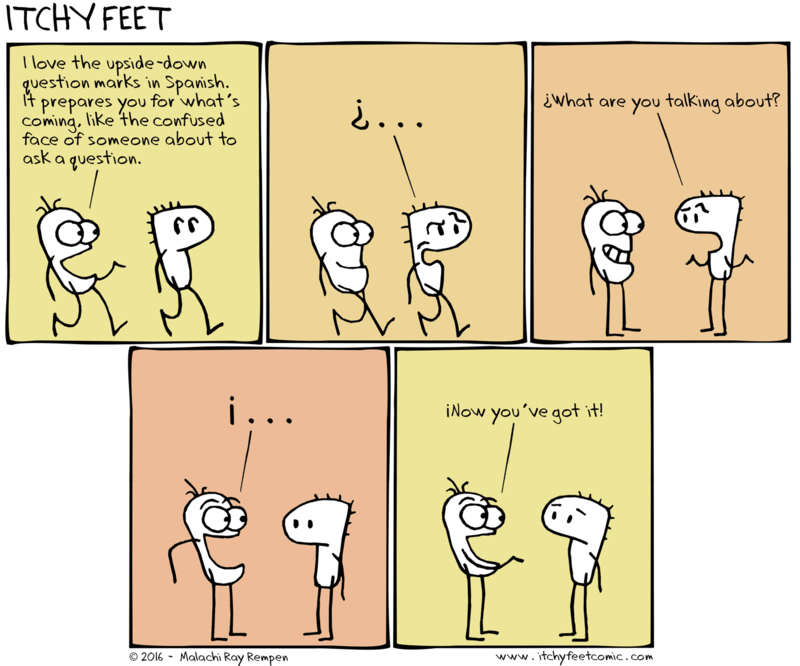 Itchy Feet: the Travel and Language Comic: ¿Confused Face? I love that upside down question mark! I hope it doesn't go out of style. You and me both. I wish they had it in Italian. I wish we had it in English! The number of times I had to read aloud with no idea that I was reading a question until the end of the sentence and had to settle for an awkward upward inflection? I wish native Spanish speakers appreciated and used them more! I'm sorry to say that I think it's on its way out. People use ¿ less and less. You can dictate other punctuation marks to your iPhone, but I always have to type ¿ and ¡ because I have yet to figure out a way to get the gizmo to recognize them in speech. Did the chowderheads who designed Apple's speech recognition even bother?